Warning: Do not read this on an empty stomach. I repeat, do NOT read this on an empty stomach. As promised, my cousin Theresa's Jersey wedding was a feast for the eyes and the stomach. It's taken me a few days to recover (and fit back into my pants), but I'm ready to share the big day now. Oh boy are you all in for a treat! The rehearsal dinner was held at an Italian place (obvi) called Il Giardino. We'd actually had another family party there years ago, so clearly we like it. The menu was classic Italian - meatballs, bread and pasta. There was a meat course too but I probably forgot to take a picture of it because it wasn't carbs. Tiaramisu - which I have to admit is typically not my fave (blasphemous Italian, I know) but this was ridonk. Ridonk = freaking good. The wedding food deserves it's own category, specifically the cocktail hour. The cocktail hour was like taking a spin around the globe. It was literally a room filled with food. I was the person just running around in circles, salivating and also taking iPhone pictures. You want to go to Japan? Hit up the sushi station! Raw oysters and lobster tails? Done. I obviously loved the Mexican station - if there's guacamole, I'm diving in. There were custom made martinis complete with an ice sculpture. For the younger crowd (or my husband), there were sliders, fries and onion rings! And the pasta...you KNOW there was pasta. Here was my cocktail hour plate. Carbs only - shocker! That was only like half the cocktail hour food. There were also passed hors douerves and plenty of other stations to hit up, but I had to pace myself to save room for dinner. The dinner was delicious - a yummy salad topped with a breaded portabella mushroom and a meat course. I chose Chicken Sorentino which had a big ol piece of melted mozzarella on top. Unfortunately I didn't take photos of the dinner items because I was too busy eating them. The icing on the cake was the Viennese Table. If you're not familiar with that, it's basically a room full of desserts including Italian pastries and Irish coffees, among many other sweets like fried oreos and ice cream stations in Ter's case. Basically the desserts took over the cocktail hour room. It was a-ma-zing. And in case you are wondering, this is in addition to the wedding cake. We don't mess around when it comes to eating. That's why Italians are so svelte. There were plates and plates of Italian cookies. As you can probably imagine, I don't get Italian pastries and cookies in North Carolina, so this is a welcome sight for me. Ice cream sundaes and ice cream cones! There were mini cannolis too - my favorite! This alone was worth the trip to NJ. I wish I could have stuck some in my suitcase to take home. Here was my plate...I just had a little bit of everything! Not only was the food amazing, the decor was breathtaking. The reception was held at the Park Savoy in Florham Park and it was absolutely stunning. The ballroom was amazing with big beautiful chandeliers and windows lining the back wall. The grounds were gorgeous as well. Ter did a great job coordinating her colors of blush, gold and champagne. This is a great shot of the lush grounds. The pictures are going to be gorgeous! I loved the flowers, they were soft and beautiful. The bridesmaid dresses were amazing! They were a light pink (blush) with ruffles and flattered everyone. 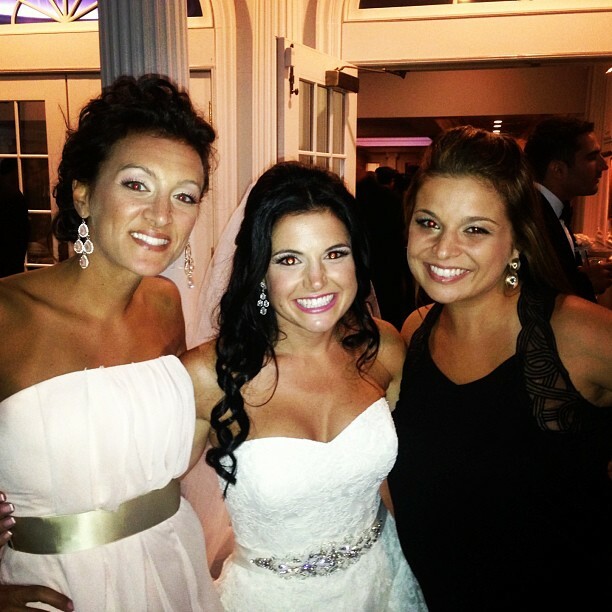 Here is my beautiful double cousin Lauren who is getting married this November! I loved the flower girl basket carried by my cousin's daughter Serina. The place cards were glittery and matched the invitations. The tables were gorgeous with different florals spread throughout the room. I loved the menu card with a flower at each place setting. The cake was stunning, I loved the brooch! One of the best parts about going to a family wedding is of course, seeing family. I saw my little bro, Matthew and my dad, Big Joe. Here I am with some of the Andolino cousins! And here we are with my bro, cousin Lauren and her fiance Patrick. Here I am with my cousins, I love them so much! How beautiful did Ter look? She was a princess! I love this picture of Theresa and Mike, they were so happy all night! They took dance lessons and rocked their first dance! This first dance photo showed off one of the beautiful chandeliers in the ballroom. Ter was a total party animal and stayed out until 4 am, dancing in her dress the whole time. I left this wedding happy and STUFFED! Congratulations to my beautiful cousin Theresa and her new husband Mike! Have a great, great week! All the food! I already ate, but now I really want a cannoli. I'm so with you on the Tiramisu, though. Maybe we should start a support group: Italian girls who love all the tasty things...except Tiramisu!